The karambit is a rather remarkable multi-use knife designed for user safety, precision and efficiency. It has a curved or hooked blade, an ergonomic handle and usually includes at least one safety ring. The forebearer of the modern karambit first surfaced in Indonesia during the 11th century as a farming tool and utility blade. Due to Indonesia's thriving trade industry, the karambit quickly spread throughout Southeast Asia and started developing strong roots in Malaysia and the Philippines. While the design of a karambit knife may vary slightly depending on its exact geographic origin, a karambit will always have an arcing blade and will offer its user functionality beyond that provided by a straight blade. Traditionally, the karambit's design is based on a tiger's claw. As such, the razor-sharp blade should be optimized for hooking, tearing, ripping, slicing and maximum efficiency with minimal effort. Karambit knives are valued for their precise cuts, high degree of retention and suitability for nearly every challenge, job or task. In self defense application, a karambit's curve offers the ability to fluidly attack and counter in a single motion and to change movement direction with ease. It also allows simulataneous striking from multiple lines of attack and readily enables hooking, trapping, ripping, and slicing. 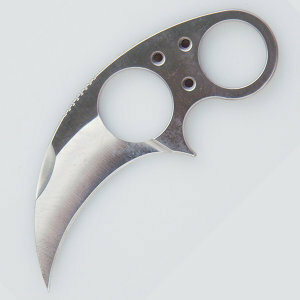 An experienced karambit wielder can also use a karambit knife to control an opponent's limbs and direction of force. Even if you can’t see your intended target because it’s behind your opponent (like a kidney or hamstring), the karambit's curved blade can still reach because it can be "wrapped around" the body to strike with accurate, devestating results. Furthermore, unlike using a straight blade in similar situations, there's no stress to the wrist of the user. This creates a distinct combative advantage by ensuring the karambit fighter's form is structurally sound and not compromised by poor body mechanics. 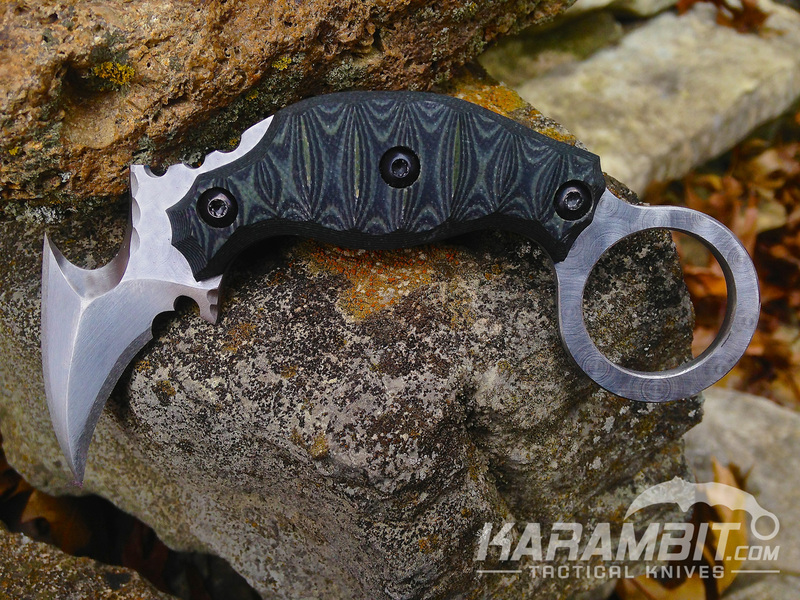 Many karambits have multiple cutting surfaces or edges arranged in various configurations and each karambit variation provides distinct advantages and benefits for utility and/or tactical use. Both production karambits and custom karambits are readily available in fixed and folding options. Historically, the karambit was widely used as a utility blade during routine chores. It would have been considered the "every day carry" or EDC blade of ancient Southeast Asia. Even today, in remote Filipino and Indonesian regions, karambits crop up as the "pocket knife" of choice. Traditional or very early versions (11th-14th century designs) of the Filipino karambit and Indonesian karambit may or may not have possessed a safety ring, which is also known as a retention ring. As centuries passed and the blade's function, features and use evolved, the safety ring has essentially morphed into a modern karambit design requirement. A karambit's safety ring is positioned at the end of the handle and it allows the user to insert a finger through the ring before closing their hand on the knife's handle. Some karambits have a secondary safety ring located on the shaft of the handle just below the blade itself. The safety ring is designed to prevent the karambit from sliding back through the user's hand while working at odd angles, on difficult tasks or in specialized environments (like underwater or while hanging upside down). In battle, the safety ring provides a strong, sure hold in all conditions and through the most unexpected stressors. The karambit's safety ring makes the knife exceptionally difficult to disarm or to turn against its user and it also allows the wielder to rely on the blade’s design for increased weapon retention instead of depending on grip strength alone. Whether the user’s hand is open or closed, moving or motionless, palm-up, palm-down or anywhere in between, due to the safety ring, a karambit knife is always secure and in optimal position for use. A karambit's grip security is particularly valuable when the knife is covered in dust, mud, water or blood or when the karambit is being utilized at the difficult angles required in combative application. There are few weapons, blades or tools able to deal as much damage as easily or impressively as a karambit while still possessing deadly grace and dark appeal. For a proficient karambit user, the ability to effortlessly maneuver the blade into a variety of positions (especially during the unpredictability of combat or other tactical situations) without fear of losing their grip on their weapon is priceless. While the blade originally served solely as an ancient utility tool in the same vein as the modern-day "Swiss Army Knife," a good tool rises to meet new challenges and in the war-torn villages of Indonesian and the Philippines, the trusty karambit readily lended itself to battlefield use. At some point, karambit knives became intertwined with Pencak Silat (also spelled Pentjak Silat), the indigenous and unimaginably deadly close-combat fighting art of Indonesia. It is now widely recognized as one of several traditional weapons commonly associated with silat and several other Southeast Asian martial arts, especially Filipino kali. 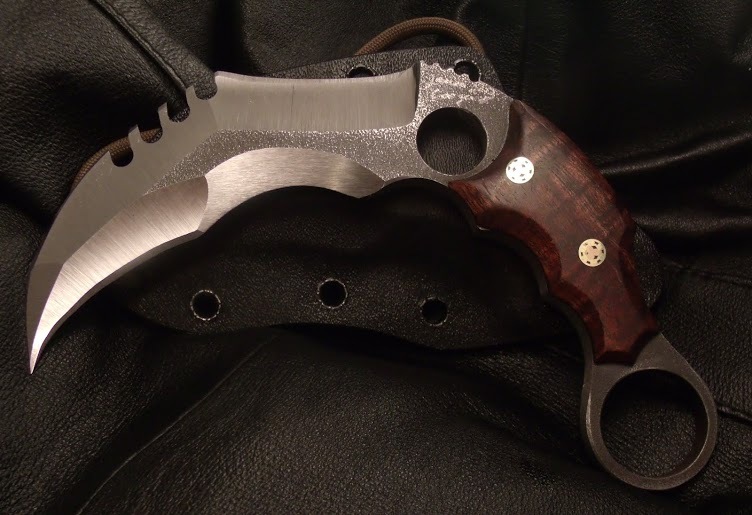 It’s hard to say whether the art and battle impacted the karambit’s design or the unique combative advantages of the karambit influenced the development of Pencak Silat. Regardless of whether the chicken or the egg came first, the karambit is now well-known as a feared and formidable tool of destruction when found in the hands of a skilled pesilat (or silat player). A “player” is someone who practitices Southeast Asian martial arts which include not only Indonesian Pencak Silat, but also Filipino Kali, Arnis, Eskrima, Malaysian Bersilat, Bruneian arts and Kuntao. It’s very rare to find a skilled karambit player who doesn’t also practice one of the Indonesian, Filipino or other Southeast Asian martial arts. The exact spelling of “karambit” can vary regionally and between various martial arts, but both “karambit” and “kerambit” are commonly accepted as correct. The blade’s name is sometimes misspelled as "korambit," "kerambet," “karambite," "carambit," "krambit" or with some other combination of vowels, but regardless of how it’s spelled, the pronunciation is almost always "kah-RAHM-bit." In the Philippines and in many of the Filipino martial arts (kali, eskrima, arnis), the karambit is known as a "lihok" or "sanggot." One thing about the karambit knife is for sure, though, even when little else may be: no matter what you call it, the karambit is unmatched for its tested combat prowess, proven tactical advantages and time-honored battlefield finesse.